Hi and Welcome to Red Couch Recipes! A Blessings Mix is a visual and tasty reminder of the Pilgrim's at the First Thanksgiving. It's easy to make and flexible. I made this for our Monday Family Home Evening treat; most Mondays we have a gospel lesson or activity and a treat. We discussed the meaning of each of the items. 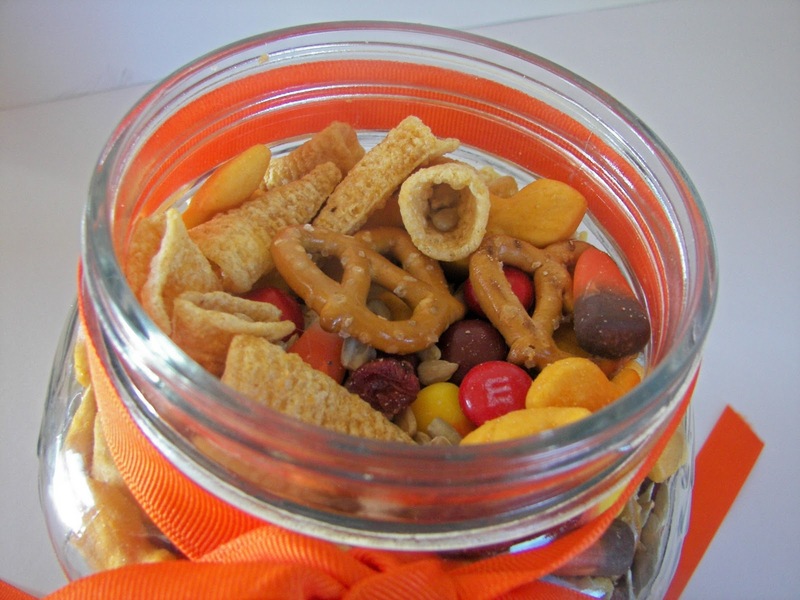 I have included the meaning and the amounts of each ingredient that I used to fill this medium-sized cracker jar. 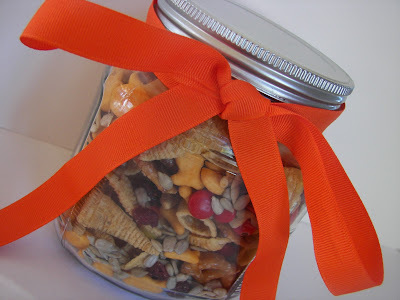 Last year I put the Blessing Mix in cellophane bags and tied it with a pretty ribbon with a tag attached telling about each item of the mix. 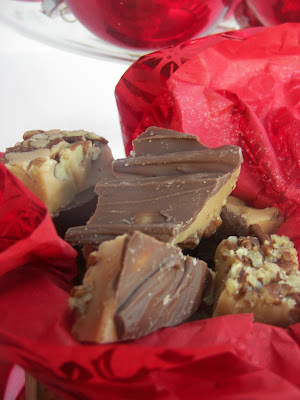 It's a fun and tasty giftie for friends and relative. Bugles (2 cups) -- Bugles: Shaped like a cornucopia or Horn of Plenty, a symbol of our nation's abundance . Pretzels (1 cup) -- Arms folded in prayer, a freedom sought by those who founded our country. Candy Corn (1 cup) -- Sacrifices of the Pilgrims' first winter. Food was so scarce that settlers survived on just a few kernels of corn a day. Sunflower Seeds (1 cup) -- Promise of a a future harvest, one we will reap only if seeds are planted and tended with diligence. Dried fruits (I used 1/2 cup dried cranberries) -- Harvest gifts of our bountiful land. Fish Crackers (1 cup) --A remembrance of the abundant sea life and the blessing it was to the Pilgrims. I adapted the ingredients and the sayings from the blog Organized Home. Today I am thankful because a new little girl arrived safely from heaven to our family -- I am now a Grandma! I am so thankful that everything turned out well! She is 5 pounds and 11 ounces and there is no name yet! Our son and his wife and new baby live in Virginia -- our son is going to medical school there. We won't see the baby until Christmas! Just so happy for them! Congrats on the little grand-daughter! How exciting. Welcome to the wonderful world of Grandparents! I have three grandsons 11,5,&3. I finally got my first granddaughter last Feb. Sorry you can't see the baby until Christmas. GRANDMA JONI - THE MOST WONDERFUL TITLE IN THE WORLD!!!! Congratulations. You will love being a grandmother. There is nothing better. The mix is fun and I love all of the meanings. What a fun Family Home Evening. Yay for the granddaughter! My first grandchild is due in April. Exciting times!! Congratulation on a new baby added to your family!!! I love this Blessings Mix! I copied the recipe :) Thank you! Congrats on your new grandbaby, thats so exciting! Love this Blessings Mix! I always forget about Bugles! Love the mix and always like gifts that have a meaning/story behind them. How wonderful, a new Grand baby! I know you are excited. 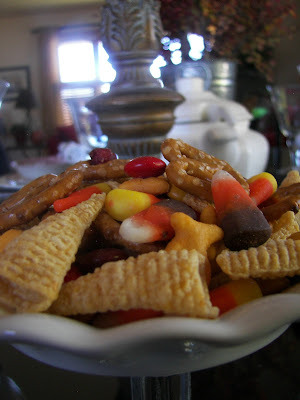 I love the blessings mix and I will make some if I can still find the candy corn. Congratulations, Joni! I am a fairly new Nana myself and there is nothing better in the world. I didn't understand how wonderful it would before our grandson was born but I SO get it now :) What a tiny little thing she is! I'm just so happy all is well. Your Blessing Mix is just perfect! Your life will never be the same! Congratulations on your new little grandgirl. You will be so amazed at how much this little gal brightens each day. Thanks too for the blessing mix. It's such a fun idea and you better start counting the days till Christmas. How lovely! I like the components and meaning behind the mix. Oooh, this looks sounds yummy! Congrats, Grandma...such a wonderful blessing! 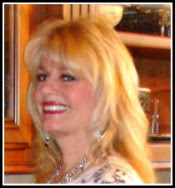 Joni, CONGRATS on being a GRANDMA(Now, that's what I call a blessing)! It's so fun, you'll love it! Thank you for such a great idea! I can't wai to make some for my neighbors. I've been saving all these jars lately but haven't decided what I wanted to put in them and I think with your post I may have found my answer. 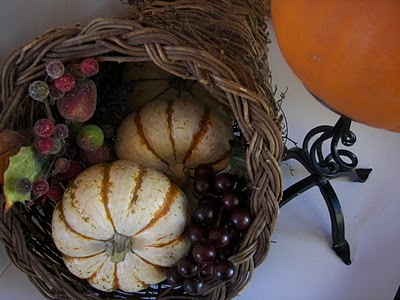 What a great hostess gift during the Thanksgiving season! This is so cute with the little bugels! I was blog hopping this afternoon and came across your blog. It's wonderful. I'll be back soon! I never thought to add Bugles to my mix. I love Bugles! This looks delish! Please stop by and link up any seasonal treats to my Theme Party on Thursdays! I love the idea for this mix and the symbolism. Thanks for sharing. I came over from Made By You Mondays. I've seen lots of snack mix recipes, but never one with meaning! It's a great idea. Thanks for sharing it with us. This is fabulous. My kiddos are going to love this! Great idea! I think we'll be making this to give away soon! Thanks so much for sharing this snack! I posted about it today on my blog. Made it recently, and LOVED it. What a great idea! This is such a SWEET idea and it's just the perfect sort of thing I like to do for my boys so I am copying this. You have my vote AGAIN on Days of Thanksgiving lol. <3 My favorite part about this is the name. Congratulations on the new addition to your family! I bet you can't wait to meet her later this month. Many Blessings on you & yours!